Come out and share the spirit of the holiday season with the north Georgia raqs community this December! There are several showcases and workshops to choose from, as well as a unique opportunity to celebrate the Persian Winter Solstice holiday of Shab-e-Yalda. Don't miss your last chance to see Aziza Nawal performing as a member of Awalim on the 8th! Join some of the most talented performers from across north Georgia for a belly dance show at the historic 40 Watt Club. The Athens community will come together as your hostess Samira welcomes local troupes Sulukele and Qamar, special guests from Atlanta (including Banat Almeh), and students from the Healing Arts Centre, UGA's Ramsey Center, and Inti'sam. Tickets are $5 in advance, $8 at the door. See a dancer for tickets or contact dancer.samira@yahoo.com. Sabeeya Sun, director of Glow Dance Studio, will teach an intermediate-level choreography with lots of layering, quick body movements & transition, shimmies, and hair twirls, set to Trans Siberian Orchestra's version of "Carol of the Bells." E-mail Sabeeya at glowdancestudio@yahoo.com for more information. "AFBD's Got Talent: Winter Edition"
Doors at 7:00; show at 8:00 p.m.
Atlanta Fusion Belly Dance presents their winter showcase, featuring performances by members of Rafi'ah Dance Company, AFBD's talented students, and some of metro Atlanta's most talented performers. Show tickets are $10; for $18, your ticket includes a delicious Persian meal (vegetarian options will be available). Full-service cash bar with drink specials. Hookah specials too! Click here to get your tickets. Come and bid farewell to Atlanta's own Aziza Nawal as she performs for the final time as a member of Awalim Dance Company. And enjoy a special guest appearance from Majda Anwar! Along with Ziah, Aziza, and Majda, you'll see performances in a broad array of styles from the Awalim Apprentices and Banat Almeh student troupe. Smith's Olde Bar is a great venue with a full bar and dining downstairs. Get your tickets here! Workshop 2:00 p.m.; Hafla 6:00 p.m.
Polish your veil technique in this mixed-level workshop hosted by Evadne Medina. Join Global Dance, Heidi Hernandez, Jahara Phoenix, Lacy Perry and Northside Tribe, Teejei, ROK Irish Dance, Luis Damian, and Atlanta SEEDs for a festive holiday hafla. Get your tickets here. 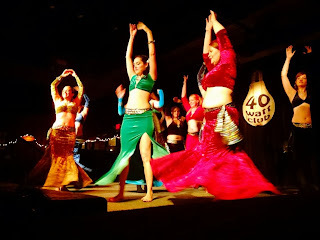 Miss Belly Dance presents a celebration of the Persian Winter Solstice holiday of Shab-e-Yalda. This event celebrates the longest and darkest night of the year, and it has come to symbolise many things in Persian poetry: separation from a loved one, loneliness, and waiting. After Shab-e Yalda a transformation takes place -- the waiting is over, light shines and goodness prevails. This event will feature performances by by Les Raissat, Beth Mendez, Amani Jabril, and Faaridah of Atlanta Fusion Belly Dance. You'll also enjoy Persian poetry with Tara of the African-Asian Business and Cultural Exchange. Click here to buy advance tickets.